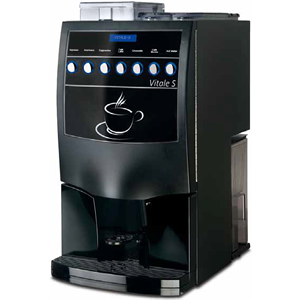 The Vitale S is a small table top bean to cup coffee machine, the Vitale can prepare up to seven high quality coffee and chocolate specialities at the push of a button. It benefits from sleek design and is simple to operate and clean. It provides a quality drink through it’s upright brewing system. It is easy to re-stock ingredients and empty waste through the removable drip tray. 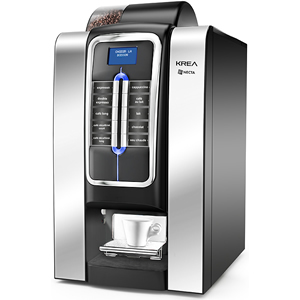 It has a blue LCD display and is available in manual tank fill and plumbed in options. Easy disposal of Coffee remnants through removable drip tray. 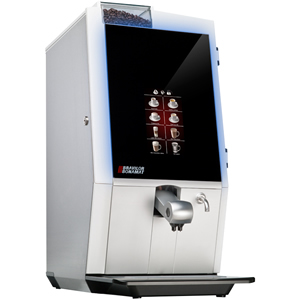 Can come as a free vend or can be operated by coins/tokens through an additional coin mechanism which can hold cups. Ideal for offices catering up to 20 staff and will produce up to 50 drinks per day.